The global trade in mangoes has grown by an average of five percent annually over the last ten years. Exports recently dropped off slightly, but have increased sharply again this year. The total volumes for this year are more than 1,8 million tonnes. That is exclusive of the approximately 250 000 tonnes re-exported from the Netherlands, in particular. In 2010, this figure was 1,5 million tonnes and in 2005, not even a million. All-in-all, this means over 800,000 tonnes more are being traded internationally than there was ten years ago. The value of the exports now stands at more than EUR 2 billion. Less than four percent of mangoes grown worldwide are traded as fresh produce on the international markets. This has not really changed over the past ten years. India remains the world’s most important mango producer, and its share is increasing. Today, more than 40% of all mangoes grown (on a commercial scale) comes from India. This country exports not only fresh mangoes (to the value of a mere EUR 200 million) but also more than EUR 100 million worth of processed mangoes. Here, the Netherlands is the biggest buyer. China is the second largest producer, with a market share of about ten percent. Chinese production is increasing but at a slower rate. These two countries are good for half of the global mango production. Thailand and Indonesia are the other big production countries. Mexico comes in at fifth place with regards to production. It does, however, take the lead, by far, when it comes to being the most important export country. However, production in this country has hardly increased in ten years. This is also the case with the other large producers, Pakistan and Brazil. More than half (55%) of all internationally traded mangoes are traded between countries within regional proximity of each other. This is especially true for North America (incl.Mexico = NAFTA) and the EU. Although Mexico is the most important export country by far, South-East Asia has the most international trade. Last year, the countries in this region exported more than 580 000 tonnes of mangoes. This is a third of the global total. More than half of this was between countries in the region. The countries in South and East Asia also send a lot (more than 150 000 tonnes) of mangoes to countries in the Gulf region. Last year, a further 55 000 tonnes were exported to EU countries. Latin America (excl. Mexico) is the second largest region when it comes to exports. Trade in this region is almost entirely focused on countries outside the region. Of the 415 000 tonnes of mangoes exported from Latin American countries last year, 230 000 tonnes went to EU countries and more than 160 000 tonnes to North America. The most significant proportion of international trade in mangoes is directed at North America (NAFTA). Based on all the countries’ export figures, this amounted to more than 550 000 tonnes. Almost 70% of this was mutual trade, with 30% coming from Latin America. Last year, the EU countries collectively imported more than 550 000 tonnes of mangoes. A third of this is related to re-export from other EU countries, mainly the Netherlands. More than 40% came from Latin America and about ten percent from South-East Asia. Mangoes are available year-round worldwide. In the (Northern Hemisphere) summer, there is more international trade than in the rest of the year. This is mainly because there is an abundance of Mexican mangoes. From May to August, a minimum of 50 000 tonnes of mangoes makes its way to the United States per month. Imports in the EU are spread reasonably evenly throughout the year. Most mangoes come from Brazil. These mangoes are brought in year-round but it is peak season for imports between October and December. Peru is the EU’s second-largest supplier. The country, which neighbours Brazil, mainly delivers between December and March/April. This period partly overlaps with Brazil’s peak season. Peru also supplies mangoes to EU countries in November. There are also mangoes from the Ivory Coast on the market, mainly in May. Israel, the Dominican Republic, Puerto Rico, Senegal and Pakistan bring product to the EU market from June/July to September. Mangoes from various other countries are also sent to the EU throughout the year. The Netherlands plays an important role within the EU. Last year, 335 000 tonnes of mangoes were imported into the EU from countries outside the Union. More than half (55% or 185 000 tonnes) of this ended up in the Netherlands. The United Kingdom imported 66 000 tonnes of this fruit from non-EU countries. The amount imported from tertiary countries was 32 000 tonnes in Spain, 18 000 tonnes in France and 15 000 tonnes in Belgium. Besides the imports from tertiary countries, the Netherlands imported a small amount (12 500 tonnes) of mangoes from other EU-countries last year. Besides a small amount of Spanish product, this figure was related to re-export via France and Germany. According to Eurostat, the import total to the Netherlands in 2016 amounted to almost 200 000 tonnes. Almost three-quarters of this, 145 000 tonnes, was then re-exported. Germany was, with 60 000 tonnes, the most important buyer, followed by France with 15 700 tonnes and the UK with 12 100 tonnes. In the past ten years, imports, and the resulting (re-)exports, of mangoes in the Netherlands has shown a steady increase. In 2106, Brazil was, with a record amount of 72 000 tonnes, the EU’s most important supplier. According to Eurostat, less was imported this year, but looking at Brazil’s export figures, it seems to be more. In 2016, Peru was the other large supplier of mangoes to the Netherlands, with almost 60 00 tonnes (also a record). This year this, too, was again slightly more. The Netherlands is Brazil and Peru’s most important buyer. Much more so for Brazil, but Peru also supplies the United States, and to a lesser degree the UK (directly). In broad terms, North America (in this case, the US) is supplied with mangoes from mainly Mexico. 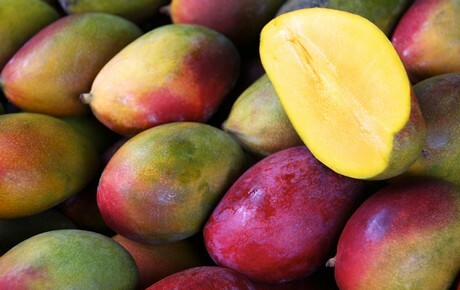 The neighbouring countries of Ecuador and Peru also supply this country with mangoes. The US also imports reasonable amounts from Brazil and Guatemala. The situation in the EU has already been explained above, with Brazil and Peru, and a number of African countries, bringing mangoes to the market here. Furthermore, it has been shown that the large mango-producing and exporting countries are located in South-East Asia. These countries export primarily within the region and to countries in the Gulf region. When it comes to exporters, the main players are India (exports 200 000 tonnes), Thailand (200 000 300.000 tonnes), Pakistan (80 000), Indonesia (35 000-40 000) and China (now 30 000 tonnes). Buyers in this region include Vietnam, China (and Hong Kong), Malaysia and Thailand. The South-East Asian countries also send a lot of mangoes to countries in the Gulf region.